This is our lovely little apartment in paradise, Two bed apt, with wifi, n tv. There is a double room with built in wardrobe and a twin room which has the same fitted wardrobe. There is a fully fuctional kitchen with all you need should you wish to stay in and cook, washing machine, fridge freezer, toaster, oven and hob, slow cooker, coffee machine n george foreman grill, on the roof terrace we have beautiful views of the Med and surrounding areas(terrace is south facing) you could have your own bbq or just sit n relax with a nice cool beer, we have comfy sun loungers and a brolly should you want to sunbathe and a beautiful rattan corner suite with table n benches for dinning and have a glass or 2 of wine or just sit in the sun, also we have beach chairs n beds with beach trolley if you wish a picnic on the beach with cool box and a beach brolly. We have a travel cot and small portable feeding chair for the little ones should you need them. The nearest beach is 400 mts away or you can take the beach path and stroll to the other beaches on the coast, there are quite a few. The Playa Flamenca centre its only a stones throw away, bike hire is available at La Zenia, there is also a bus stop outside the apts should you wish to explore more south or under the underpass bus stop if you want to go north, Villamartin (golf) or the plaza is about a 5/10 min drive, then there's the famous shopping centre The Boulevard one of the biggest in Europe where you can shop till you drop, there are restaurants, bars, 10 pin bowling, live music and lots of other things going on and only a 10 min walk, there is also lovely restaurants and Irish bars (live music every night)at La Zenia which is a 5/10 min walk, this is a great location to explore all the southern Costa Blanca has to offer.Oh and don't forget the numerous golf courses in the area. happy holidays!!! ( PS smoking only allowed out on terrace) or side balcony. As of 1st of May 2018 cleaning fee of €50 will need to be paid on arrival, or left on table with keys on departure. As of 18th of June entry will be by lock box and code will be sent on day of arrival. Any problem you can call Liz on 0034 672 830 509. Any other info you can contact me on here. Please use key to open grill on side balcony and follow TV instructions for the television. english, only English im afraid!!! We are from Fort William in Scotland, we have a small bed and breakfast which we have now sold, we move out on the 5th of July (sad day) my husband is in the building trade and hope to spend the winter in our apt. fell in love with it when i seen it advertised on fb. came out to see it and bought it there and then. the upstairs terrace with its view did it for us. walk in shower no bath. There is one flight of steps to apt and another flight to roof terrace. Lovely apartment everything you need for self catering. Great top solarium and communal pool area. Supermarket only across the road and can cut through the back of the car park to walk up to La Zenia beach and bars. Check out "Flamenca Beach commercial centre" which is behind the apartments with lots of restaurants and bars. Viva Park II is also good which is near La Zenia Boulevard. Apartment great location for checking out different areas. Thank you Barbara for your lovely review so glad you had a lovely holiday. If you ever holiday in Playa Flamenca you will love this apartment, it has everything you want on the inside and outside on roof terrace. clean and well decorated plus close to shopping and bars/restaurant. Really lovely apartment. Clean, bright all you need to have a great holiday. Thank you Anne. The apartment is really great, Clean, bright. The kitchen had everything you needed & even had a washing machine which was great. Thanks Anne, we will be back. Thank you Jo so glad you had a lovely time. Very Clean tidy with everything you need for a relaxing week. Thank you Lee for your nice comments. We have just returned home from this lovely apartment that lived above our expectations. The comfortable lounge was furnished with tasteful light furniture and matching accessories. The bedrooms had comfy good quality beds and duvets. The kitchen had everything you need, with lots of crockery, pans and glasses. The roof terrace had sea views and was furnished with comfy sun loungers and a table and chairs to enjoy a drink or a meal and watch the sunset. All amenities were within walking distance with restaurants, bars and supermarkets. Ann and was lovely, she was there to meet us on our arrival and she came at the end of our holiday to see if everything was alright during our stay. 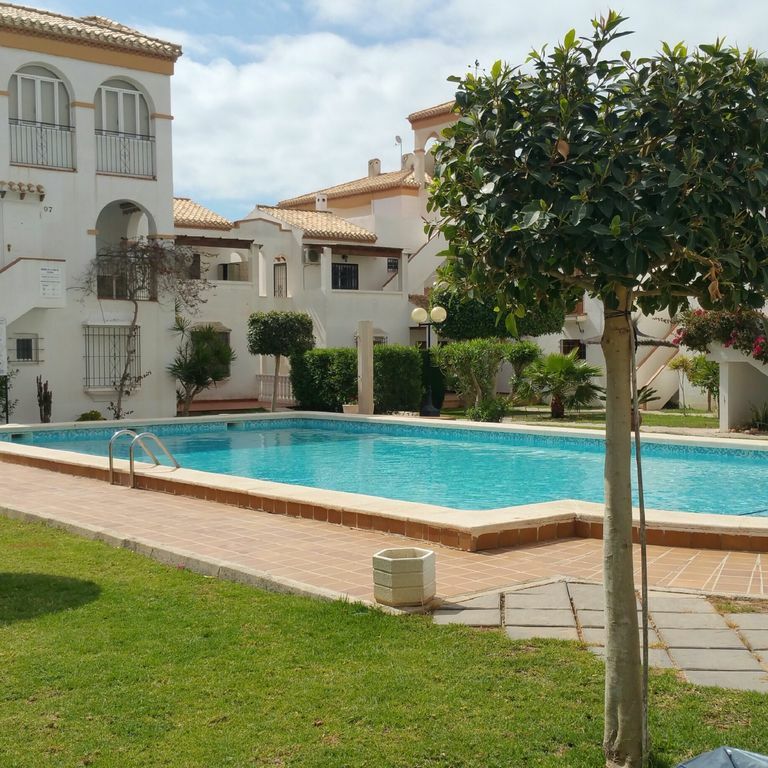 We would recommended this apartment to our friends and anyone who would like a nice clean apartment within a beautiful complex near all Playa Flamenca has to offer. Thank you Diane for your lovely review it was a pleasure having you and lovely meeting you. Dorothy R.Irvine, Ayrshire, United Kingdom. We stayed in this apartment for four weeks during August/September 2017 and were extremely happy with it. It is comfortable and clean, with everything needed for an excellent holiday. There is a small terrace off the living area, which is ideal for relaxing with a morning coffee. Also a large, private roof terrace, with sea views and sun from early morning 'til night, which is perfect for sunbathing during the day and dining in the evening. The apartment is ideally situated for a number of beaches, La Zenia Boulevard Commercial Centre and a large street market which takes place every Saturday. There are bus stops immediately outside the complex for buses to Cartagena, Las Alcàzares and Villamartin and another nearby for buses to Torrevieja and Alicante. The Tourist Information Office, five minutes walk from the apartment, can provide maps and bus timetables. Various bars, restaurants and shops are within easy walking distance and a large supermarket is situated across the road from the complex. During our stay we were able to visit all of the nearby beaches from Punta Prima to Campoamor, on foot. Most of the paths are along the coast and offer beautiful views for as far as Torrevieja in one direction and La Manga in the other. Unfortunately, many of the paths are pretty uneven and some have steps, however if you are able to manage, the views and the beaches make it worthwhile. Most of the beaches have seating at path or road level. Alternatively, a bus can be taken to Campoamor for the beaches at Campoamor and Playa de la Glea. Thank you so much for your lovely review it is very much appriciated, it was so nice to meet you both in person and was glad we had, you are a lovely couple and looking forward to seeing you again next year.thank you so much. you can visit the grand design house at Tormmendo where you can quad bike, horse ride, archery, swim airgun shooting, watch the animals being fed or just have a coffee and cake in the grand design house, made famous by Kevin Macleod and the gran design team, there is also an aqua park at Torrevieja or the adventure park at Lo Rufte near Torrmendo with its long death slide, if it happens to rain you can go to the Orihuela Costa Club with its indoor pool.